Rosemary and Thyme Infused Fairy Cakes. 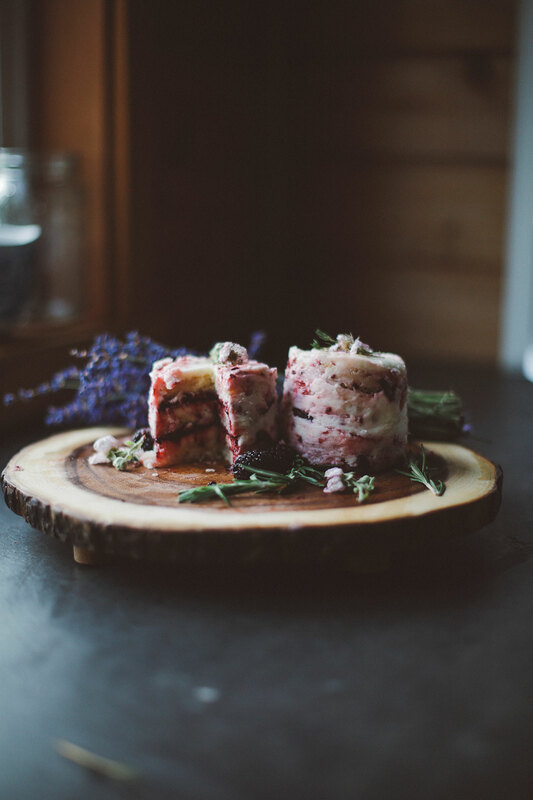 These sweet, herbal cakes are the perfect size for your next garden tea party and will delight palates of all ages. 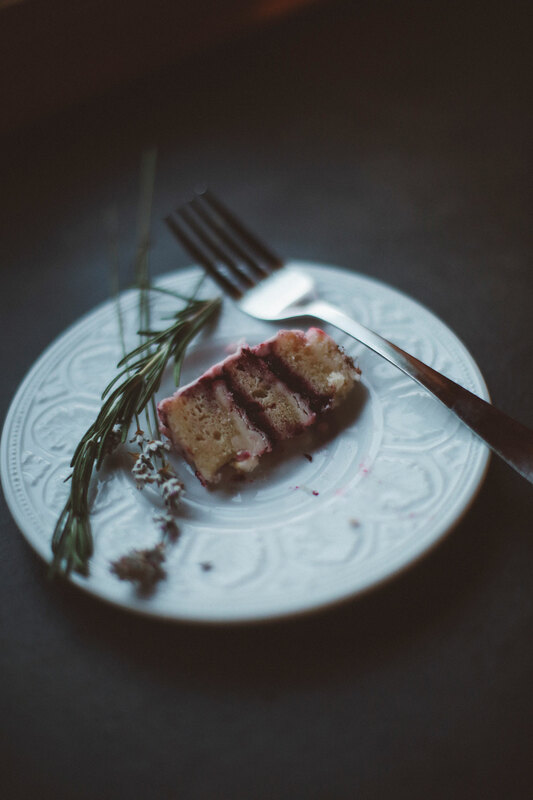 I know what you’re thinking – rosemary and thyme cake? But trust me on this one, it’s awesome. Herbs make everything better ; if we added parsley and sage this cake would be the perfect ode to Simon and Garfunkel, but that combo might be a bit too weird, even for me. So, we’ll stick with the latter and bring a bit of savory deliciousness to this sweet bite. Last week, I made a four layer white cake, filled with blackberry and lavender jam via a recipe from Half-Baked Harvest. It was delicious and perfect for the solstice party I was attending. Vashon has loads of blackberries and lavender, so it couldn’t get much more down-home than that. But I wanted to make something more bite-size, something my boyfriend and I could enjoy without making an entire cake. 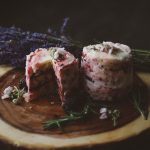 I had been toying around with recipe ideas and random ingredients to throw into a batter, and rosemary and thyme intrigued me. Herbs in general taste very earthy to me, but rosemary and thyme especially so. Their scent makes me let out a big sigh and beg anyone willing to “SMELL THIS!” But I wasn’t entirely sure how to best inject the flavor and not make it too overpowering. 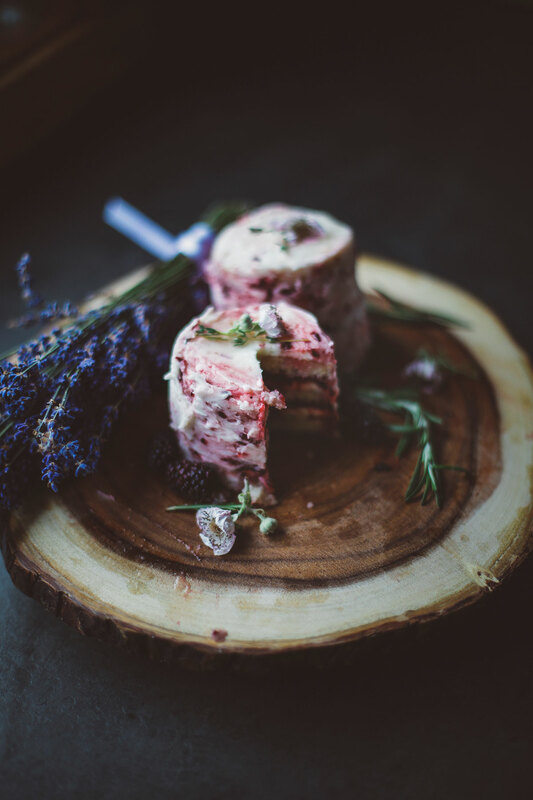 With the help of some blackberry jam and easy-to-make simple syrup, the flavor is spot on – a earthy and sweet, delicious bite, filled with vanilla buttercream goodness that I can imagine fairies would readily enjoy at a forest tea party. These little cakes have quite a few steps, but don’t let that intimidate you. It’s actually pretty easy. I would say that you should have a good chunk of time set aside, or maybe throw together some of the ingredients the day before – like the simple syrup and jam. Because I had made a similar cake a few days earlier, I had a mason jar full of jam and a container of simple syrup ready to go. I just altered the flavors a bit to suit this recipe. Half-Baked Harvest does an excellent job of laying out the cake and jam instructions, so head on over there if you want the full run-down, but I’ll give a little summary here, too. I’m sure you hate tabs just as much as I do. Because I didn’t want to make a full cake, I decided to divide the original recipe and make two little mini cakes. 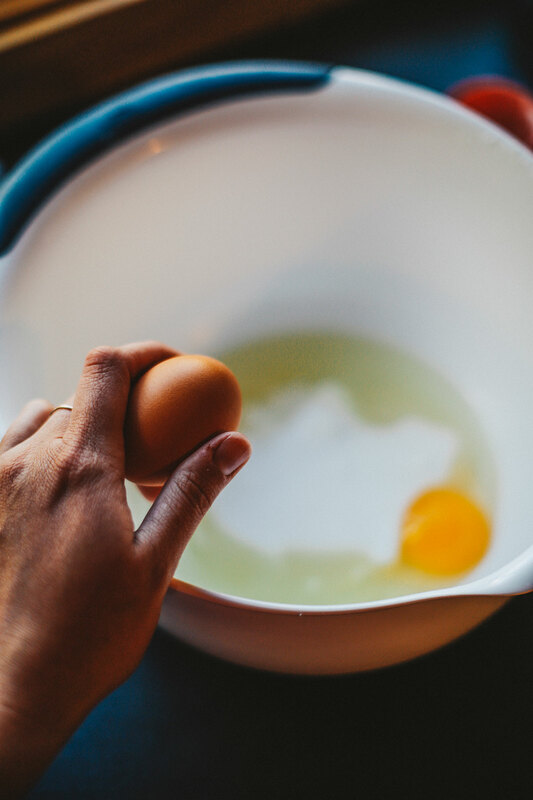 But the recipe calls for three eggs, and not wanting to divide yolks and whites and mess all THAT up, I decided to split the recipe in thirds and pray to the cake gods that it would be enough for one cake pan. The cake gods answered my prayers – it was just right. If you’re like me, math is not your forte. So if figuring out one-third of 1 1/2 c buttermilk and one-third of 1/2 c plain greek yogurt seems somewhat daunting, I’ve made all of your mathless dreams come true! Introducing the recipe divider. Big ol’ thanks to Skillet for making life a little easier for us numerically-challenged folk. The recipe you’ll find below is one-third of the original and perfect for filling one 8-inch cake pan. While your cake is baking, get to work on your jam and simple syrup, unless you are great at time management and decided to make it the day before! If you’re baking on the reg, it doesn’t hurt to make a large batch of syrup and keep it around for whatever you may need – cakes, tea, etc. For those who haven’t baked with it before, it is a great way to keep your cakes moist, especially if you are going to be freezing them. It’s basically equal parts sugar and water, so for a small batch I use 1/2 cup of each. I had this in the fridge from the last cake I made, so I put it back into the pot and added my flavors. 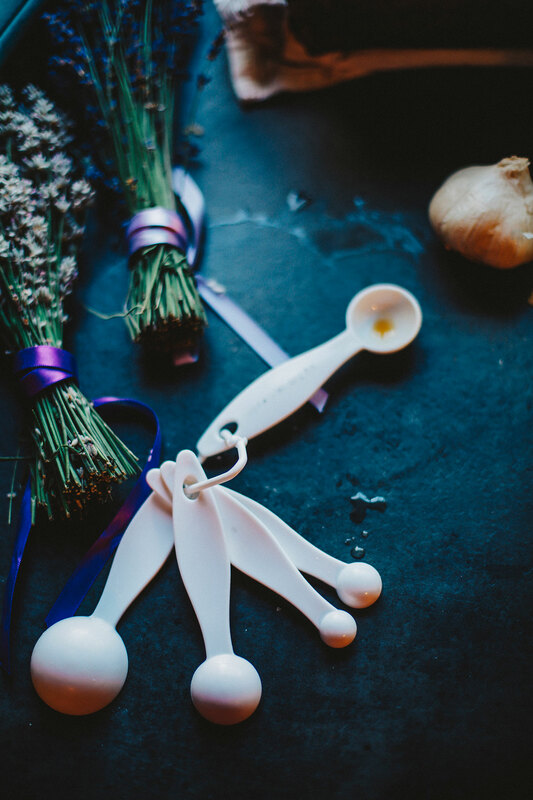 This is where your palette gets to have some fun, add as little or as much as you want, but do make sure your herbs are fresh, not dried. Now comes the first step in infusing some earthy flavors. Once your cake is baked and cooled, slice off the very top and squeeze that simple syrup over it, letting those herb-filled flavors seep in. Wrap it up in cling wrap a few times and stick it in the freezer. Make sure your cake is completely covered because you don’t want any freezer flavors sneaking in. Why freeze the cake? It’s the best hack I’ve found to make icing easier, resulting in fewer crumbs and/or sides of the cake falling off. Actually, I don’t think this is a hack at all. I’m pretty sure it’s just a known step to experienced bakers. Fingers crossed I’m becoming one of those. While your cake is firming up, you can make your jam and buttercream. You could divide this recipe into thirds, but why? 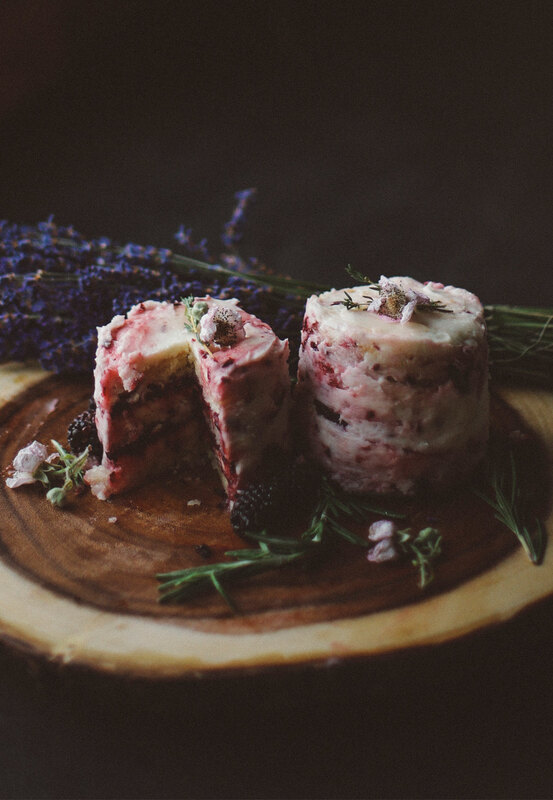 You should make the whole thing and be left with a delicious mason jar of blackberry lavender goodness to spread on toast, put in cakes, or just take a spoonful when you need a little pick-me-up. It’s really easy to make, though I’d like to note that I had to let it cook longer than instructed for it to thicken up the way I wanted. Once your cake has cooled considerably, I’d say 30 minutes to an hour, slice it in half horizontally. I like to use a very simple leveler that kind of acts like dental floss, wiggling through the center of the cake. Despite its simple design and cheap price, it works really well for me. But if you don’t have a leveler and just want to eyeball it, go for it. These layers don’t need to be perfect, as they’ll be filled with jam and buttercream. YUM. You can add more simple syrup to the layers here if you want – in hindsight I think I would have. But again, this is really dependent on your taste. How earthy do you want it to be? Before you separate your layers, you’re going to cut them into perfect circles. I have circular cookie cutters that I like to use – for this I used the larger of the three. Press the cutter into the cake three different times, giving you six different layers of cake. You’ll be left with some leftovers like you see above. Shove those into a mason jar with some jam, simple syrup and buttercream, and you’ll have a delicious trash cake to bring to work with you the next day. Aren’t you glad you made extra jam? Now’s the fun part! Take those little layers and fill them with all of your prepared goodness. I took the original top layer (puffy side up) and made that my bottom layer of the little cakes. One of your cakes is going to have two top layers in it – that’s fine. Just make sure it’s not your final layer or else your cake won’t have a flat top. Fill your layers with buttercream first, and then add a significant layer of jam. Repeat this step with your next layer and finish it off by sandwiching it with a flat top. Now, do a crumb coat of buttercream around the cake, and pop it in the freezer for a few minutes while you ice the other one. This is a naked cake, so the icing isn’t supposed to look perfect – that’s why I love these simple treats so much. Let that gorgeous jam shine through! Yaaas, Cake Queen! 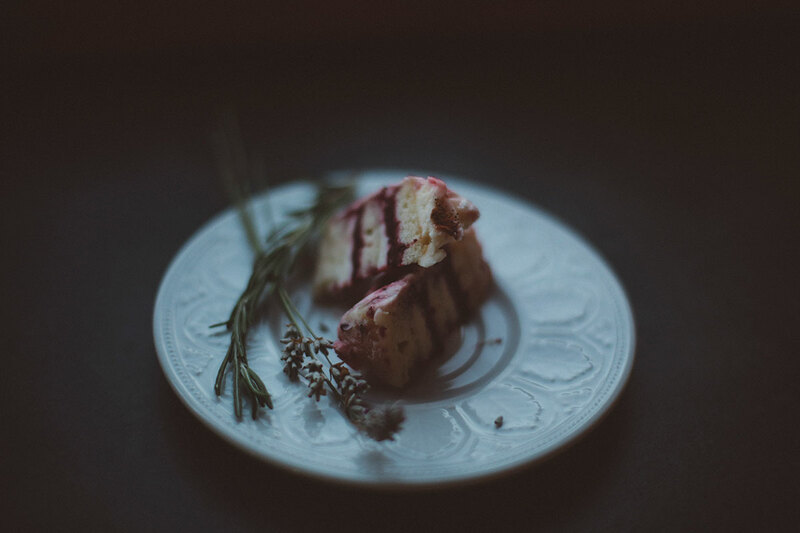 I really wanted that rosemary and thyme syrup to jump off the plate, so I squeezed a few more flavor jewels over the finished cake, and I did not regret it. Sugary, savory drops hit your palette as you cut into that sweet buttercreamed morsel. 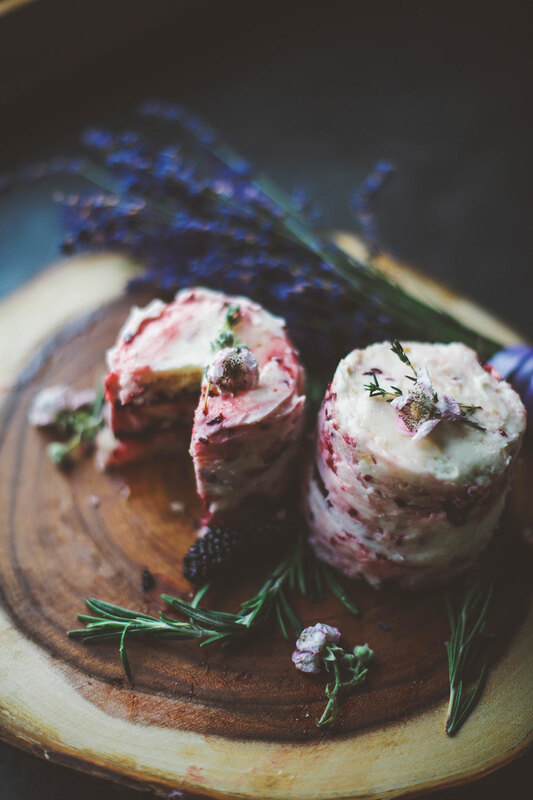 Top with a few sprigs of thyme, some wild blackberry flowers if you have them, and finish off your platter with berries, rosemary and a few sprigs of lavender. Voila! You have a cake fit for a fairy tea party. Or in my case, an evening with my beau, cuddled up with an episode of The Office and a delicious slice of a tiny cake. 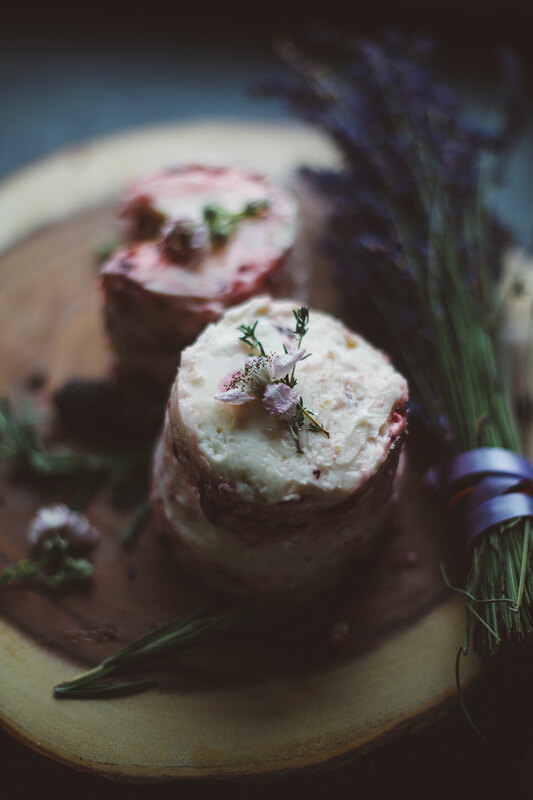 These miniature white cakes are infused with scrumptious rosemary and thyme simple syrup and filled with a tart blackberry lavender jam. Sweet and savory, these little delicacies will make you dream of wooded groves, cottage nights and fairy tea parties. Enjoy! 1. Preheat oven to 350 degrees F. Grease 1 (8-inch) round cake pan. Grease with butter and lightly flour, being sure to remove excess flour before pouring in batter. 2. 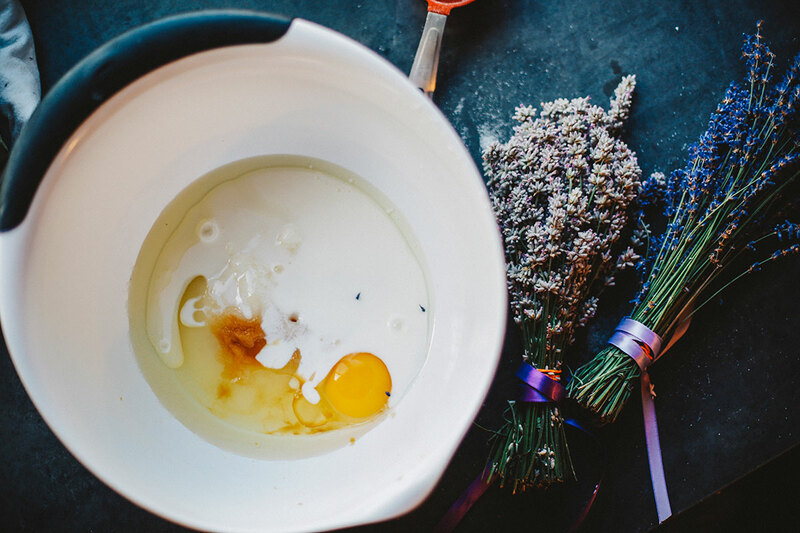 In the bowl of a stand or hand-held mixer, beat together the canola oil, yogurt, eggs, sugar, vanilla and buttermilk. Add the flour, baking soda, baking powder and salt and mix until just combined. 3. Pour the batter into the cake pan and bake 25-30 minutes, until the top has just set and is no longer wiggly in the center. 4. Remove and let cool five minutes, then run a knife along the edges of the pan and turn the cake out onto a cooling rack. 1. Add the blackberries, honey, lemon juice and lavender to a medium size pot set over high heat. Bring the mixture to a boil; once boiling use a potato masher or fork to break down and mash the berries. 2. Continue to cook for 8-10 minutes, or until the jam has reduced and thickened by 1/3. Remove from the heat and let cool. The jam should thicken as it cools. 1. Add softened butter and vanilla to the mixing bowl and mix until completely combined. 2. Add powdered sugar and beat on low until it is incorporated. Then move mixer up to medium-high speed. Scrape sides and bottom of bowl often. When completely mixed the frosting may appear dry. 3. Add milk a little bit at a time until frosting is the consistency that you'd like. 1. Boil water and sugar together until the sugar has completely dissolved and the mixture is beginning to slightly boil. 2. 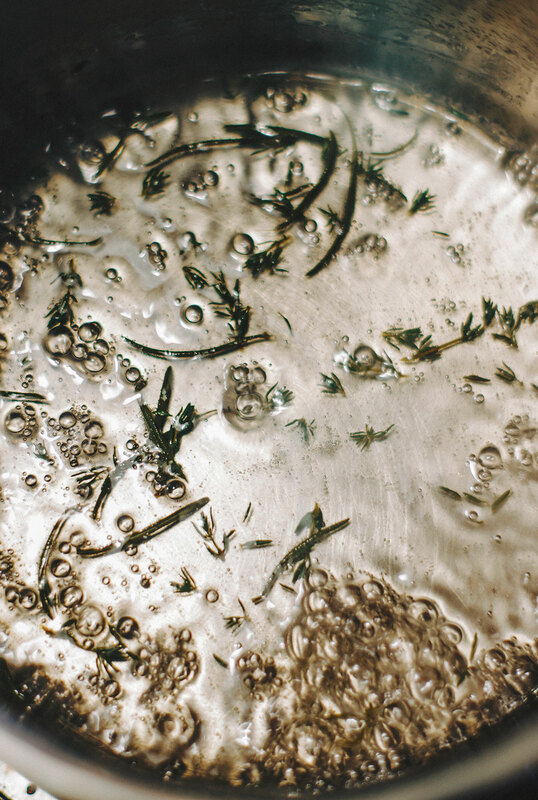 Add in your rosemary and thyme, tasting every so often to see what you should add more of. Remember, you can always add more, but you can't take away. 3. Add in the juice of half a lemon for acidity. 4. Let cool, and place syrup and herbs into container. 1. 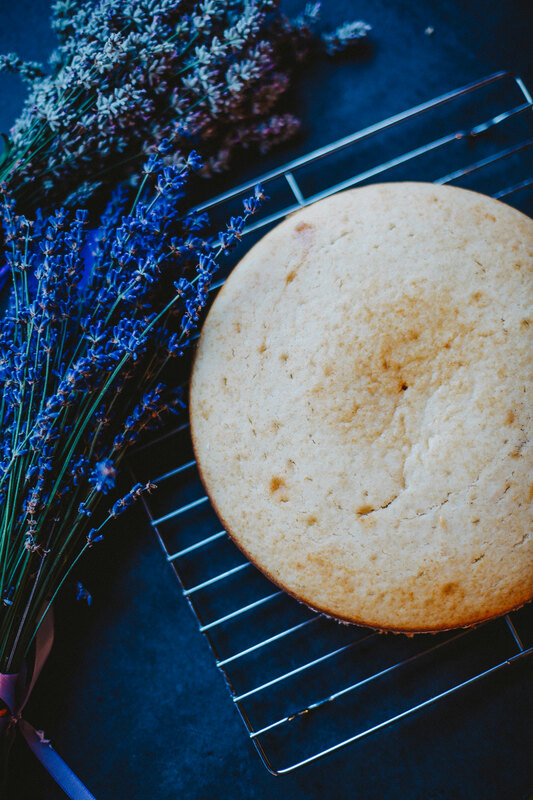 Once your cake is cool, cut off the top with a leveler and spray or pour your rosemary and thyme simple syrup over the top. 2. Wrap cake tightly in cling wrap (leave no edge exposed) and place in the freezer. Let cake firm up for 30 minutes or so. While the cake is in the freezer you can make your buttercream. 3. Once cake has cooled, remove from freezer. Use your leveler to cut the cake in half horizontally. 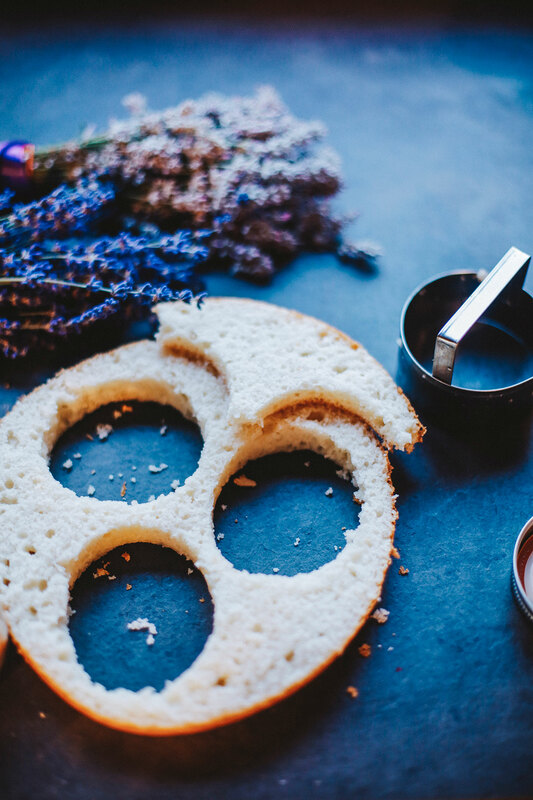 Without taking the halves apart, use a large circular cookie or biscuit cutter to cut three circles in the cake. 4. Remove excess cake bits and prepare to ice your mini cakes. Coat your bottom cake layer with a hearty layer of buttercream, followed by a layer of jam. Repeat this step with your second layer and finish with a flat piece of cake as your top layer. 5. Ice your cakes outside lightly with a crumb coat of buttercream, and place in the freezer to firm up while you assemble the other cake. 6. Once the icing has firmed, put on your second coat of buttercream. The jam will seep through your layers and into your second coat, but this is part of what makes these cakes beautiful! 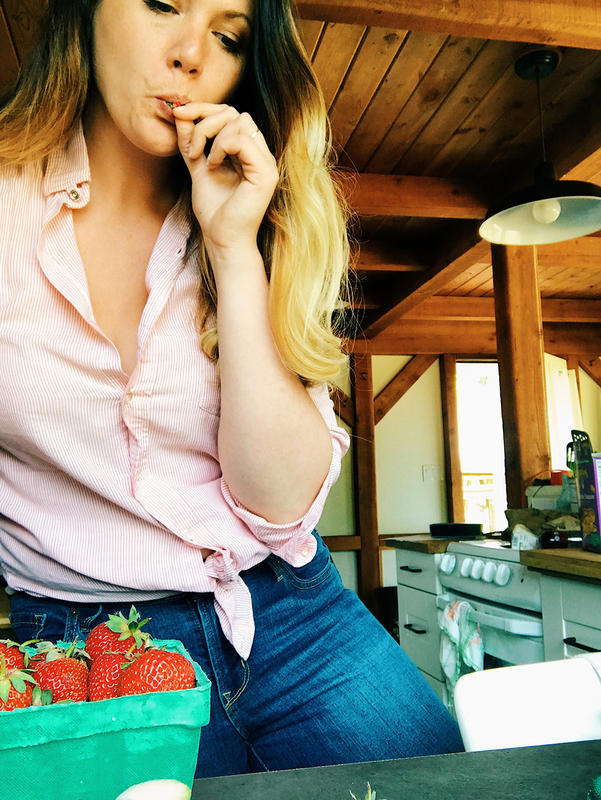 Embrace the nakedness of your fairy cakes. Squeeze extra simple syrup over the buttercream. Not only will it taste great, but it will add some pretty sugary beads to these delightful bites. 7. 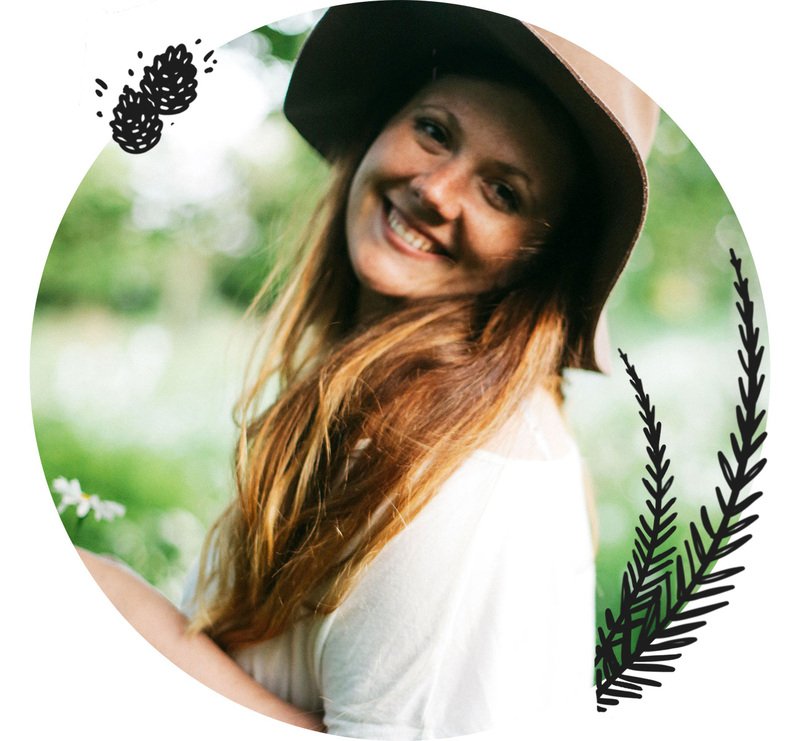 Plate your cakes with wild blackberry flowers, sprigs of rosemary and thyme and whatever other natural decor you have available. 8. Invite your magical friends and enjoy! 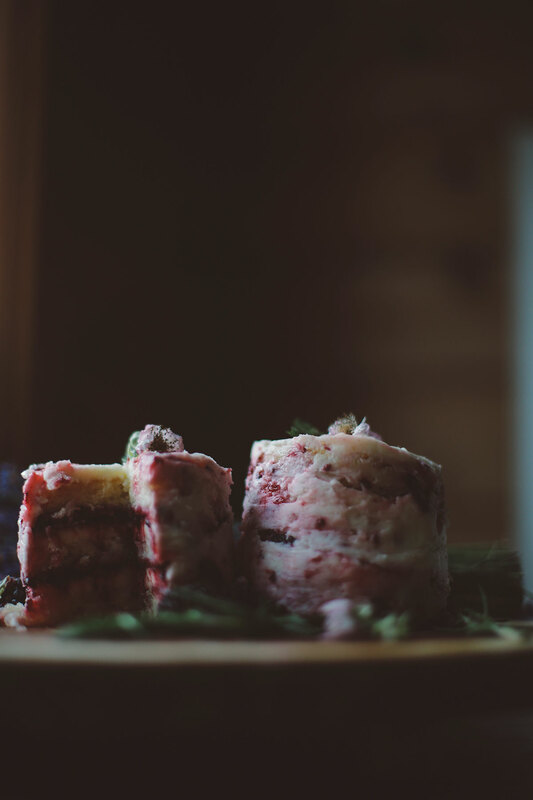 * For extra delicious fun, take your remaining cake bits, buttercream and jam, stuff them into a mason jar and bring some "trash cake" to work or give as a gift to a friend. ** You will have a mason jar full of jam, so if you don't want that much (why wouldn't you?) divide the recipe into thirds.